For those of us who loved the movie Top Gun, who have at least some small connection to aviation in the military (my grandfather flew bombers in WWII and my husband's cousin was also a pilot who was killed in an incident on an air craft carrier), or even those who are just interested in airplanes and the military, Dave "Bio" Baranek's TOPGUN Days: Dogfighting, Cheating Death, And Hollywood Glory As One Of America's Best Fighter Jocks is an interesting and engaging read. I chose this as my entertainment during the car ride to visit my in-laws and it did entertain. Reading the book, which includes a glossary of military terms and lingo at the back to reference, you get a small sense of the nerve that those who fly for our military must possess to put themselves at risk each day. Bio (Baranek's callsign) puts the reader in the cockpit with him and his pilots and describes routine and not-so-routine flights, practice dogfights, and takes us inside the elite TOPGUN training facility both as a student and as an instructor. If you were ever interested how things really happen at TOPGUN (not the Hollywood version), this is the book to read. The book also includes more than 50 full-color photographs of the fighter jets in action and some personal photos from the author. 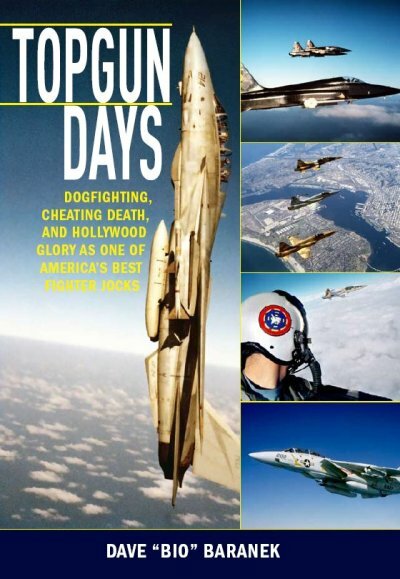 Dave "Bio" Baranek's TOPGUN Days: Dogfighting, Cheating Death, And Hollywood Glory As One Of America's Best Fighter Jocks is available at bookstores. To celebrate the 25th anniversary of the movie Top Gun, you can download the Kindle and Nook versions of the book for only $4.99.